The Moto E, Motorola’s budget friendly handset, seems to be next in line to get the Android 5.0 Lollipop update. We dare to say that seeing as both first and second generation Moto X and Moto G handsets are receiving Android 5.0 Lollipop as we speak. Remember that this is a staggered rollout, so if the update hasn’t popped up on your phone yet, it should in the following week. 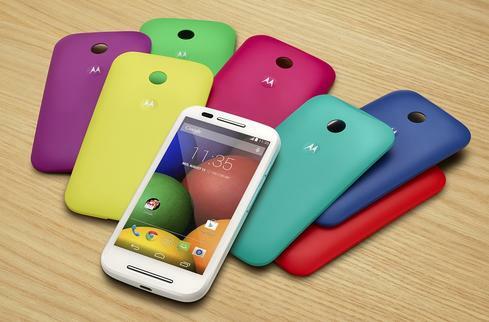 The Moto E hasn’t received any update yet, but it is ready to receive the latest and greatest from Google. The Moto E is the last handset that Motorola originally announced as a candidate for Android 5.0 Lollipop, so it’s about time it started getting the OTA, in our humble opinion. An exact starting date for the Lollipop rollout hasn’t been announced, but it’s safe to say that we should start receiving an OTA on the Moto E in the first week of February, the latest. In the meantime, the Motorola Droid Turbo, Razr and Razr Maxx should also be getting the Material Design treatment, although it depends on the carriers and regions as well. You can see Android 5.0 Lollipop on the Moto X (2nd gen) pure edition in the video below. Both Motorola and Google have repeated to us that the Android 5.0 Lollipop rollout is a time-consuming one, so we should be patient. Already Moto X and Moto G owners are getting giddy over the update and can’t wait to have it installed on their handset. The Moto E should start receiving Android 5.0 Lollipop in the following days as part of the soak test, after which a global rollout should begin. Since these are mostly speculations based on how the OTA was progressing through devices at various OEMs and carriers, take this with a grain of salt. The Motorola Moto E was a surprise on the list waiting on Lollipop, but we are glad that the budget-friendly handset is indeed getting the update. This handset is a crowd-favorite because it has a decent price combined with decent specs. If you’re not familiar with the Moto E, here’s a quick rundown of what it has to offer. You can buy it unlocked for around $105 in online retail stores and you will get a 4.3 inch display with a 540*960 resolution adding up to 256 ppi pixel density, running on a dual core Snapdragon 200 XPU backed by 1 GB RAM and 4 GB expandable internal storage. You get a 5 MP camera on the rear, but no LED flash to accompany it with. A 1980 mAh battery is in charge of power-supply, and you get all basic connectivity options, too, save for LTE.